DC 37 White Papers identify waste. Since July 2005, funding for the city’s contract budget has increased rapidly, climbing by 2009 to a record cost of $9.2 billion for more than 18,000 contracts. This is equivalent to 15% of the city’s tax-levy budget and more than 46% of the city’s controllable spending. District Council 37’s analysis in its 2009 white paper Massive Waste at a Time of Need focused on only ten contracts spread over eight city agencies listed below along with the potential savings that could be realized if the work were performed, as DC 37 proposed, by city workers. 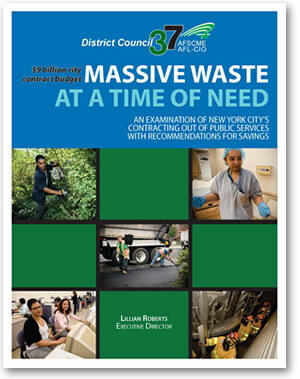 DC 37 put forward A Better Way to Balance the Budget in 2010, an update one year later, which reported how the recession had cut revenue and driven NYC’s human needs to record levels while no study had been done of the city 18,000 wasteful contracts. In Public Health Care Under the Knife – DC 37 Response to “Restructuring HHC: The Road Ahead” DC 37 also critiqued a 2010 report on the NYC Health and Hospitals Corporation and made proposals to stop contracting-out of public health services to keep vital HHC workers on the job. The findings of DC 37’s white papers and the union’s campaign against contracting out received ongoing coverage in the Public Employee Press.